I have yet to hear any practical solutions to the problem of violence and conflict between the African-American and other minority groups and the police from Donald Trump. Here is a response that can be made by local police all over the country. Here is the complete text of a letter from the Brattleboro, VT chief of police published today in the Reformer. I wanted to take this opportunity to make a few comments about the recent Black Lives Matter March that was held in Brattleboro on July 13. There is a culture of mistrust towards law enforcement that currently exists in our country. Recent events have catapulted that mistrust to levels that exceed those of recent memory. Police interactions with citizens have been called into question resulting in anger, disbelief and frustration. These feelings have manifested themselves into protests, rallies and marches throughout the country. Some have been peaceful, others have not. There was a march in Brattleboro that should be recognized. Unfortunately there were no national news agencies on hand to help report this story. The participants in this rally were there to express their frustration towards social injustice and police excessive use of force. From the start I noticed members from across the spectrum of our community and many new faces. They spoke about the injustices towards minorities and police brutality but they also discussed solutions to rectify those injustices and ways of better policing. This march was interesting to me as it not only addressed the problem but suggested ideas towards the solution. It was peaceful, respectful and informative. To sum it up in one word – positive. I spoke to many non-participants along the route and their feelings were the same. 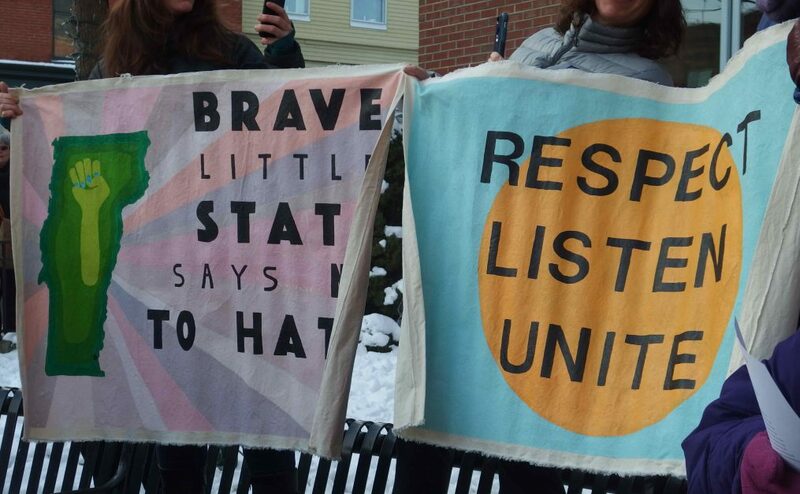 The conduct of those demonstrating in Brattleboro drew people to them, not away. People wanted to join them, to be a part of this movement. In my opinion, that is how to make a change. Negative actions rarely produce positive outcomes. To the organizers and to all those who participated, I would like to commend you on the overwhelmingly positive difference you made through your peaceful demonstration. It was a model for the rest of the country to emulate. People expect the police to respond to a wide variety of situations with thoughtfulness, compassion, respect and empathy. I can assure you that every Brattleboro Police officer wishes to achieve that same goal. Many of you know our local officers personally by name and know of our desire to police in a fair and approachable way. We are engaged with the community from the officer on the street up to the chief, but we are not perfect and will always be able to learn and improve the ways we serve. For that to occur we need you, our community, to let us know how you feel. Please call, email or stop by to talk to me about your concerns. In these challenging times, the Brattleboro Police Department remains steadfast in the commitment to the safety of all in our community. Michael R. Fitzgerald is the chief of Brattleboro Police Department. He can be contacted at Michael.Fitzgerald@vermont.gov. I mentioned the good community policing happening in Brattleboro in my post earlier today. Here is more proof. I hope more police departments adopt Chief Fitzgerald’s approach rather than going into a totally defensive mode. As I said earlier, we need more talk and less violence on both sides. Time to fire up the blog again after a long break. I’ve found the world just too depressing to write about with violence and war all over the world including police shooting civilians, civilians shooting police, and too many people just shooting each other, Yes, the major incidents we hear about are racial, but there are just too many that are not. This Tom the Dancing Bug cartoon illustrates only too well what kind of society we seem to be rapidly moving toward. The violence is numbing. And our Congress seems unable to act. We can only hope that there is not another arms race with law enforcement adding more tanks and military style equipment, but more emphasis on community policing. Granted that Brattleboro is a small town, but our police chief started something he calls “Coffee with a Cop” several years ago. Anyone can go to a local restaurant and talk to an officer. Larger places can do something similar in precincts and districts. More talk can lead to more trust. OK. Maybe not always, but there will never be trust if everyone is just shooting at each other. The attack on police officers in Baton Rouge, La., cast a grim mood over the opening of the Republican National Convention here, as Donald J. Trump responded to the killings with a stark warning that the country was falling apart. A string of shootings targeting police officers, as well as the recent killings of two black men by police officers in Minnesota and Louisiana, had already pushed gun violence and social unrest to the center of the presidential campaign. Mr. Trump has campaigned on the theme of “law and order” since the assassination this month of five police officers in Dallas, and he is likely to amplify that message in the coming days. “Law and Order” unfortunately doesn’t remind me of the great television series, but of Richard Nixon and the 1960s and 1970s. They were scary times to be a protester for civil rights or against the war in Vietnam. Unfortunately, Trump’s message is going to resonate among those who feel threatened by the changes taking place. Changes like more gay rights, the possibility of a woman becoming president (First a black man and now a woman! ), and most of all the slow change from a predominately white country to one that is more diverse. Cleveland has assigned about 500 police officers specifically to handle the convention, and it has brought in thousands more officers to help, from departments as distant as California and Texas. But some local officials have expressed concern about the possibility of violence owing to Ohio’s open-carry gun laws. Though demonstrators and others in the convention district have been barred from possessing a range of items, including gas masks, there was no prohibition on the brandishing of firearms. Mr. Giuliani has been a forceful critic of the Black Lives Matter movementand has been outspoken in his defense of law enforcement practices over the last few weeks. I worry that Democratic calls for unity are not good enough in face of Trump and Giuliani bombast. NPR laid out the contrast nicely. “There is no justification for violence, for hate, for attacks on men and women who put their lives on the line every day in service of our families and communities,” she said. She will be speaking at the NAACP convention today and it will be interesting to hear what she has to say. For me, the appropriate response is to begin with a ban on sales of large magazines and then move on to banning assault style weapons. Both the Dallas and Baton Rouge shooters were trained in the military and the idea that they can easily get and use similar weapons after they are discharged is frightening. We actually need more talk, not more guns. Let us hope there is no violence in Cleveland. You have to admire Ta-Nehisi Coates for his persistence is getting the discussion started. In 2014, Coates wrote a long piece in the Atlantic Magazine titled “The Case for Reparations”. He generated a lot of buzz back then and we are still talking about it almost two years later. If you haven’t read it, you probably should if you have any interest in race in America. My parents were incarcerated into “relocation” camps during World War II because of their race. In 1988, President Reagan signed the Civil Liberties Act to compensate more than 100,000 people of Japanese descent who were incarcerated in internment camps during World War II. The legislation offered a formal apology and paid out $20,000 in compensation to each surviving victim. The law won congressional approval only after a decade-long campaign by the Japanese-American community. Reparations were easily determined in this instance. There was a list of everyone who was in a camp regardless of age. Those who had died in the meanwhile got nothing and their estates and heirs got nothing. My parents, uncles, and aunts got checks. But the money was not enough to cover what had been lost, but was more of a token giving the apology some weight. Coates has recently taken Vermont Senator and Presidential candidate Bernie Sanders to task for not supporting reparations. What candidates name themselves is generally believed to be important. Many Sanders supporters, for instance, correctly point out that Clinton handprints are all over America’s sprawling carceral state. I agree with them and have said so at length. Voters, and black voters particularly, should never forget that Bill Clinton passed arguably the most immoral “anti-crime” bill in American history, and that Hillary Clinton aided its passage through her invocation of the super-predator myth. A defense of Clinton rooted in the claim that “Jeb Bush held the same position” would not be exculpatory. (“Law and order conservative embraces law and order” would surprise no one.) That is because the anger over the Clintons’ actions isn’t simply based on their having been wrong, but on their craven embrace of law and order Republicanism in the Democratic Party’s name. One does not find anything as damaging as the carceral state in the Sanders platform, but the dissonance between name and action is the same. Sanders’s basic approach is to ameliorate the effects of racism through broad, mostly class-based policies—doubling the minimum wage, offering single-payer health-care, delivering free higher education. This is the same “A rising tide lifts all boats” thinking that has dominated Democratic anti-racist policy for a generation. Sanders proposes to intensify this approach. But Sanders’s actual approach is really no different than President Obama’s. I have repeatedly stated my problem with the “rising tide” philosophy when embraced by Obama and liberals in general. (See here, here, here, and here.) Again, briefly, treating a racist injury solely with class-based remedies is like treating a gun-shot wound solely with bandages. The bandages help, but they will not suffice. To a certain extent Coates is correct. Whether one uses the rising tide image or sticks with trickle down, programs begun in the 1960s like affirmative action and various anti-discrimination laws in employment and housing have helped but have not come close to solving the problem that black Americans are more likely to be poor than white Americans. No one can deny that slaves, former slaves, and their present day descendents have not suffered every form of economic discriminations one can think of because they have. The question is are reparations a good solution. Conor Friedersdorf provided some speculative reasons why Bernie Sanders is right in not embracing reparations in his recent piece in the Atlantic. Perhaps Sanders just thinks reparations are bad policy on the merits. There are many plausible reasons that a principled radical might come to that conclusion (though it isn’t entirely clear to me that Sanders is that radical even on matters of class). Perhaps he is convinced that the highest incarnation of justice is a government that redistributes resources toward its citizens based wholly on their need, and doesn’t want to shift the Overton Window toward any model that is predicated on dessert beyond need, or that would redistribute wealth from poor to rich in some instances. That seems consistent with principled socialism. Perhaps when Sanders says that reparations would be divisive, he doesn’t mean that they would damage his campaign or the Democratic coalition by dividing its supporters––the plausible interpretation that Ta-Nehisi argued against in his critiques––but that it would divide Americans of different races against one another in a manner likely to cause more harm to vulnerable minority groups than good, or necessitate a divisive process of bureaucrats defining who qualifies as black. The Overton Window referred to above is a media pundit term meaning the range of discourse the public is willing to accept. When I commented on a friends Facebook page during a discussion of reparations that I thought it would be difficult if not impossible to figure out who was owed, another friend commented that maybe that was what Coates was trying to do – get us to talk about the issue. If that was his aim, to move or enlarge the Overton Window, then he has succeeded. I have a question for Sanders. Why not take up Coates’ call to support a study? Perhaps rather than demand reparations now we, Coates included, should push Congress – and all of the Democratic Presidential candidates to support HR 40. Let’s keep talking about this. I visited Civil War battle sites on my honeymoon: Antietam, Harper’s Ferry, Gettysburg. It was early May and they were beautiful places. Lush fields, trees, wild flowers – and graves. Hundreds and hundreds of men had died there fighting for both sides. I doubt that many were particularly political. They were recruited into adventure or a sense of honor. Perhaps someone they admired was building a company from the small town where they lived. Most New England towns have a Civil War monument. I’ve seen them in Ohio and Pennsylvania, West Virginia and Virginia. Oh, certainly the politicians and some of the men at the top – the generals – believed in the cause. That is their job. But the ordinary soldiers went because someone asked them or because all their friends were going or they got paid to enlist and the family needed the money. The current desire in a lot of places, Richmond and New Orleans to name two of them, is to remove the statues of the generals and politicians. 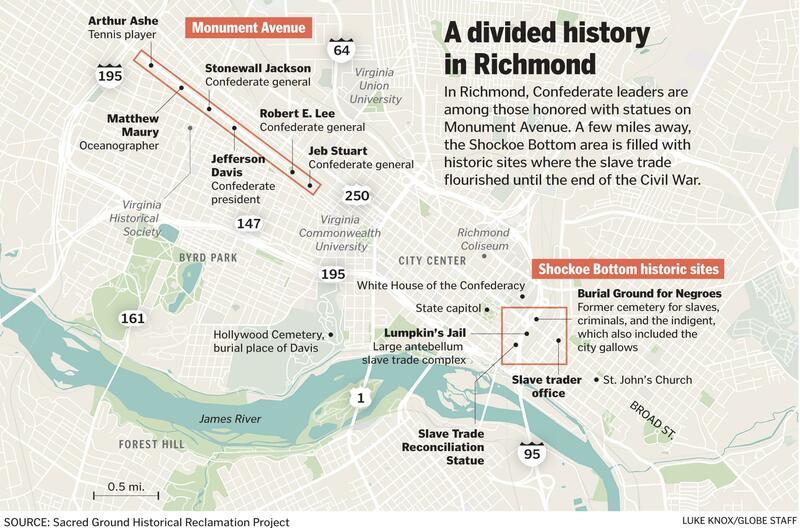 I lived for many years just blocks from Monument Avenue in Richmond. The large monuments stand in circles that can be difficult to get to depending on the traffic: Jeb Stuart, Robert E. Lee, Jefferson Davis, Stonewall Jackson. Plus the explorer Matthew Maury and tennis great and local hero, Arthur Ashe. (Ashe was added after a great deal of controversy.) Most Richmonders probably couldn’t name all the statues and likely don’t know who any of these men are. The Boston Globe had a feature story on July 4th. Ana Edwards stood on Monument Avenue, one of America’s most elegant boulevards, and stared with disbelief at the inscription on the 67-foot-tall memorial to Jefferson Davis, president of the Confederate government that was based here during the Civil War. “Exponent of Constitutional Principles,” the inscription said about Davis. “Defender of the Rights of States.” There were no words explaining Davis’s role in the enslavement of hundreds of thousands, no hint that much of the nation’s slave trade was conducted here in Richmond, at a time when black lives plainly didn’t matter to many, except as human chattel to be exploited or sold. Edwards had never read the description and I hadn’t either. And neither had the Mayor of Richmond, Dwight Jones. But unlike many in Richmond and other places across the South, I don’t think the statues should be moved or put in museums or crowded together in a kind of Confederate History Park. I believe they need to be used as teaching tools. Earlier this spring, my husband and I were in Annapolis where there is a prominent statue of Roger Taney on the grounds of the State House. Taney was the Chief Justice of the United State Supreme Court and wrote the infamous decision in the Dred Scott case declaring slaves were not citizens and couldn’t sue in federal court. Instead of removing the statue, there are signs that explain who Taney was, who Dred Scott was, and why the decision mattered. I like this approach much more than taking down the statues and putting someplace where most people will not see them. Annapolis also has a new memorial to Kunte Kinte (subject of Alex Haley’s Roots) on the City Docks where he landed as a slave. The controversy over Monument Avenue comes at a time when there is a fight to prevent development in Shockoe Bottom where there were a number of slave jails and auctions. I wrote about the preservation effort back in April. Slavery is an ugly part of our past and the men who believed in it, the Jefferson Davis’ and Roger Taneys need to be remembered. We can’t forget who they were and what they did, any more than we should forget the slave auctions. Richmond, and other parts of the south have a prime opportunity to educate. Put up some markers, publish some informational materials. Make sure that all those bicyclists and spectators at the big race in Richmond in the fall know who Jefferson Davis was and what he did, but leave the statue. Leave the statue as a reminder of our dark past. Leave the statue so we don’t forget. And make sure they, and other visitors to the City know about Shockoe Bottom. We can’t always be proud of our history, but we do need to remember it.